My great, great grandmother came through to me from Spirit and told me that she was an early Spiritualist. Her name was Elizabeth Cordis Foster, passing to Spirit in 1891 with the medical diagnosis of pneumonia. ‘Liza’ as she called herself was a lovely lady in Spirit and she confessed that she died of a broken heart in that lifetime. She explained that the love of her life was a man by the name of Walker, a veteran who was killed ‘out west’. 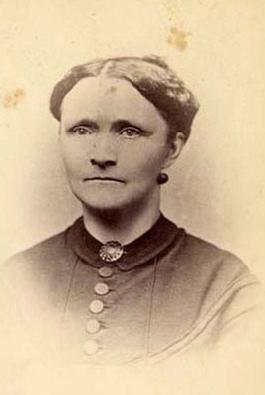 Elizabeth Foster insisted that she married twice; becoming a young widow in 1858. In 1862 Liza and her father traveled from their home in Libertyville, Illinois to live in Washington, DC at the request of a family friend, President Abraham Lincoln so that they could assist in the war effort. Note: People living in Illinois and ‘the North’ called the Civil War the War of Rebellion. My grandfather Clark in Fairfax, Virginia was described by his granddaughter, in her letters, as owning ten plantations in Fairfax County. He held slaves and called the conflict the War of Northern Aggression. I am using Spirit’s reference here as my Illinois ancestors were supporters of their friend and neighbor, Abraham Lincoln. I often refer to that wonderful lady in Spirit by another name, the one she first gave me of Ana. In trance mediumship Ana comes through frequently. She also confirmed a connection to my lifetime in medieval Scotland. Ana explained that she was Elizabeth Steward, the first wife of Sir William le Hardi Douglas. She was the mother of James Douglas, my stepson. She also provided evidence to me of being a Lakota Sioux healer; information I was able to research. But so far, I have not found any validation in documents that tie her information to a specific name. Elizabeth Foster, Elizabeth Steward and Ana are the same soul. My guide Ana has provided information on two lifetimes that I was able to verify. As the mother of James Douglas and wife of William Douglas she told me that her husband was known as Lord of Fawdon. The Scottish Antiquarian, George Chalmers, reviewed the 13th century document referencing her marriage and the transfer of Steward lands to her husband in his publication Caledonia. He stated emphatically that the man who married Elizabeth Steward was not William Douglas but another Douglas known as Lord of Lugton. Through the relentless insistence of both William le Hardi and Elizabeth Steward in Spirit I was able to uncover the fact that Lordship of Lugton was not a viable estate until well after 1283, the year Elizabeth Steward’s dowry was transferred to her husband. Elizabeth Foster was a very gentle woman. When she came through to me from Spirit her personality was the same. She exuded that identical energy or feeling whether she was Liza or Ana or Elizabeth Steward. When she showed me herself as my great, great grandmother or my friend Ana or even the mother of James Douglas, she came through with the same loving, kindhearted personality. In the beginning of my work on reincarnation, I was struck by the number of times I incarnated with my guides in Spirit. I wondered if it was by design or just luck. Liza provided the details of her 19th century incarnation, I began to understand that her place in my current lifetime was actually part of a well thought out plan and not just a coincidence; the connections were intended. I often shared some of my spiritual information on Elizabeth Foster with my father. He does not accept my work with Spirit but his response was curious. He felt compelled to give me one of the most treasured gifts from Spirit that I have ever received. It was some jewelry that once belonged to Grandmother Foster. My dad described it as a ‘Civil War piece’, but it was actually a matched set of a garnet brooch and earrings. My father found the brooch wrapped in an old piece of cloth in the bottom drawer of a dresser that was left to him by his mother, my grandmother Lucretia Seymour. Some years before, at the time of Gram’s death, my father inherited her house and remaining possessions. By some odd circumstance a relative was able to gain access to the house and abscond with Gram’s jewelry, all except the garnet brooch and earrings once owned by Elizabeth Cordis Foster Deming, my great, great grandmother. The set was still safely hidden away not to be found until ‘the right time’. “It was meant for you to have,” Elizabeth said through medium Rita Berkowitz. Spirit started sending me messages again, through visions in the early morning hours around that same time. Through research I was able to identify the scenes as taking place in 19th century Washington DC. As I watched the black and white videos I realized that I was following a lady as she walked up the steps to the White House. I saw her move gracefully past large round pillars near the entrance of that historic structure. There inside the foyer I saw more pillars, which surprised me until I saw 19th century photos of the White House and verified the location and design of the vestibule. I also saw a man walking with her on the right whom I believe was her father from photos I had of Dr. Foster. In my vision Elizabeth slowly turned toward me and I could see that she was wearing the lovely garnet brooch that I now own. As she stood there in the vestibule I then noticed a very tall, thin man coming down a corridor. He was wearing a light colored, ill-fitting suit; his thinning hair appeared as a wild array all over the top of his head as he wiped his brow. While finding it strange that he greeted the Fosters personally, I was sure the man was Abraham Lincoln;. I did not see any footmen or servants. Elizabeth said that it was a very warm evening. She and Dr. Foster were there to attend a séance. I felt we were heading for a room towards the back, to the right, as we walked through the first level of the White House. I believe from online descriptions that it was the location of the Red Room. During the Civil War in Washington DC, Spiritualism was very popular, especially with the ladies of society. Their male counterparts like President Lincoln and Liza’s father Dr. Foster were cautious skeptics to the new craze. Both men attended some of Mrs. Lincoln’s Spiritual events but kept a sharp eye out for fraud, Liza told me. It was Elizabeth’s cousin, Horace Greeley the newspaper editor who had the courage to openly embrace the phenomenon; attending a séance ten years earlier to contact his dead son. He wrote about the event and said that the communication was not a stunt but very real. The First Lady was thrilled to have her Illinois friends in attendance at the White House séance that evening and Liza was eager to be there, wearing the brooch set as she hoped to hear from the man who gave it to her. Liza commented on the séance and said that the experience was exciting. The actual messages seemed quite vague, but she vowed to continue her quest to hear from Spirit, attending other séances in Washington DC, Connecticut and St. Louis. “It was a very popular event,” Liza explained. The brooch set is something I wear for special events now when I do demonstrations of Spirit Communication for large groups. I had thought the jewelry was a gift from her father but Liza told me emphatically that it was from her first husband. She has confirmed through messages delivered by other mediums that she wore the garnet brooch to a séance at the White House. 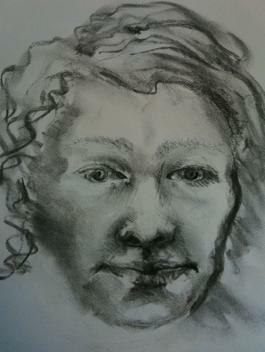 And during a public trance demonstration with a Spirit artist in Finland a picture was drawn of Elizabeth wearing her brooch as she brought through further evidence of her life in the 19th century. I need to add some information on Liza’s sister. When I found the photograph of Helen Foster in January 2011 I was asked to add it to the book during the final edits. Helen came in at that time to provide other information of her medieval lifetime that I was able to verify: “I was your sister in law in Staffordshire in the 14th century with the same name of your friend (Alice),” she said; adding with a giggle, that she wanted her story to appear in the book too. I was able to verify that Eleanora Douglas Bagot had a sister in law Hawise (Alice) de Ferrers who resided at Chartley in Staffordshire. The two ladies were friends as well as family. Eleanora and William Bagot were godparents to Hawise’s daughter Eleanor, residing in the same shire. Helen Foster Cook died a horrible death in a train accident in 1881. She was scalded, burned extensively by high powered steam and passed to Spirit fourteen hours later. Her husband Ansel Cook jumped to safety from the wreck of the Libertyville Express. Liza and Helen expressed some consternation with Ansel’s actions. “My grieving father was furious with my husband for being so selfish,” Helen told me. Liza said that she insisted that Helen’s body was returned to Enfield, NH for burial in Dr. Foster’s large tomb. I have made plans to be buried there myself with Liza, Helen, Jesse and Mary Greeley Foster. Shortly after Helen’s death, Elizabeth and George Deming moved to Enfield to run a store and apothecary on Main Street.